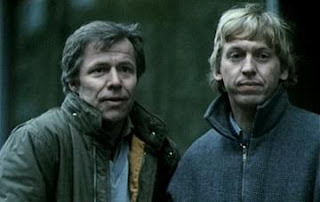 Bo Widerberg's 1984 film The Man from Mallorca is taken from Leif GW Persson's 1978 novel Grisfesten (Pig Party or Pig Roast), which seems to be the first appearance of the central characters from several later novels, Detectives Jarnebring and Johansson (who were at that point in their careers working in Vice). Several other characters who are at least referred to in later books also put in an appearance (and you may recognize Sven Wollter as Jarnebring in the photo pasted in here, from more recent crime fiction TV series, if not Tomas von Brömssen as Johansson). As a movie, The Man from Mallorca is very close in style to Widerberg's The Man on the Roof, taken from a Sjöwall/Wahlöö novel (The Abominable Man). The story is presented without commentary, in short scenes that are sometimes confusing until the story starts to come together about halfway through (and the style is in the end very effective). 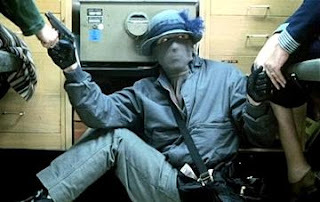 The story concerns a post office robbery by a clever and capable thief: Jarnebring and Johansson ar ethe first on the scene and, having let the thief get away, they become involved in the investigation. The thief proves to be not only ruthless but well-connected. A persistent theme in Persson's later books is already in evidence: the conflicting interests of the police and the security police (whose methods and aims are a constant source of tension, criticism, and even comedy for Persson). The thief's costume is also quite funny (I'm not going to explain--not exactly a plot spoiler, but...), and the fact that the robbery takes place during a Lucia celebration gives a very Swedish slant to the scenes (not quite the Swedish Christmas of Bergman's Fanny & Alexander, but close). Viewers may find the ending of the movie rather cynical, though it is absolutely consistent with Widerberg's style and Persson's story (don't know if the book's ending is the same, since it hasn't been translated—though if I could find a copy my Swedish is probably just about adequate to tell if the ending is substantially different--anyone who's read it is invited to step in with a comment). It's interesting that a movie from an earlier Persson novel has been available with English subtitles for years, while Persson's writing is only now appearing in English--possibly Widerberg's post-Elvira Madigan international rep is the reason... In any case, it's quite a good movie, and an interesting insight into the characters' early careers (with interesting ironies for those who've read about their later careers). P.S., did you recognize Sven Wollter from his recent TV-detective role?